All the world knows that Murano glass is the best there is. How did you decide to become a glass blower and to specialize in making chandeliers? The glass in our area is a source of employment and opportunity to express ourselves in an independent job. It is easy to understand why so many people that work here say "you live in glass", referring to both the job and the art. We therefore work with the glass in a broad sense. Then, according to ability, the liking or the attitude of each individual, we can choose the pure glass making, called “vetreria” (glassware), the chandeliers, which are divided into more simple or complicated (eg “Rezzonico” chandeliers) or the glass art (sculptures, chandeliers and works of art of the highest level). 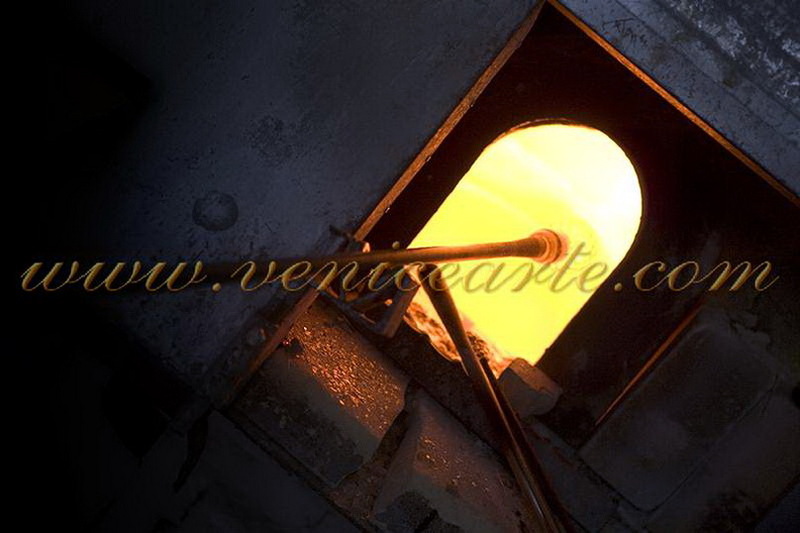 But, above all, it is the passion that brings you to choose your true path inside the world of Murano glass. The job is very hard and the conditions are almost extreme: it is very hot both in summer and winter. If are lacking the passion you will never, ever, do this job. Is it an art that is passed down in generations...in which one starts working as an apprentice with a family member as a youth? How long does it take to learn the art? My family has always worked glass for generations: my father, my grandfather and so on. I personally have started the job with the help of my older brother. How long does it take to learn the art? We must first say that regardless of the learning ability of the future Master glassblower, the period called "apprenticeship" is 5 years, during which you must attend to the teacher, cleaning, washing and so on: your job is to be the "garzone di bottega" (apprentice). Only after these five years you can start a career as a glass maker. You should know that our environment is different from any other, special and unique. The names of tools, the stages of the processing, the way we work. We use terms which are handed down for generations, and it takes a long time to learn all this. I was able to shorten this period of "apprenticeship", learning the job in about 3 years, not because I am better than any of my colleagues, but because I used to work 24 hours a day, learning the job step by step, from the mixing of the raw materials to the final packaging stages. In my house we used to talk about glass, to "breathe" glass, wet "ate" glass, we lived in the glass, but not obsessed to the point of forgetting the good-night kiss. Why do you think Murano is world-renowned for their glass artistry? 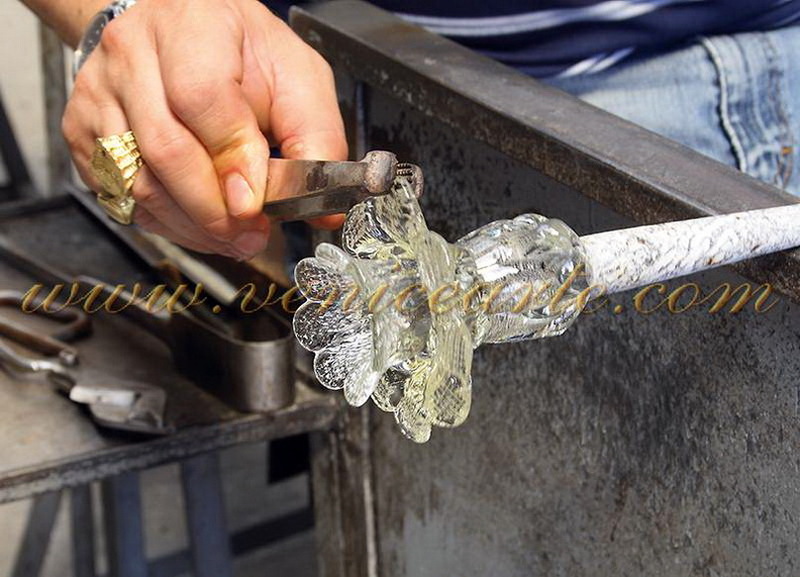 Because, no doubt, Murano has a tradition of showmanship: giving a “soul” and a meaning to the glass. Not only for the beauty of the glass itself, which is and remains unique, but for being able to give a "feeling" to this magnificent glass. This can only mean one thing: art! The Murano glass is a glass that reveals its artistic beauty because of its forms and its colors. 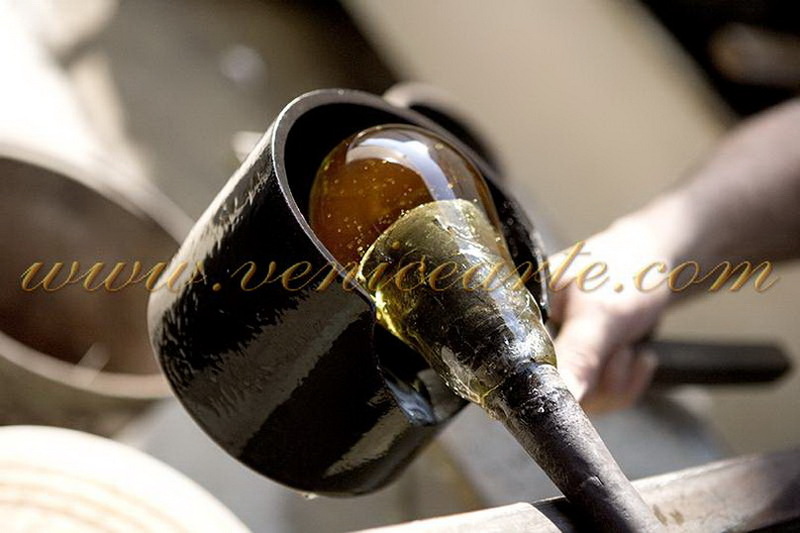 It is more than 43 years that I work the glass and 13 years that I make chandeliers for Venicearte. The ability to give a shape to the glass itself, with lines and colors always different, but especially to include in these forms a feeling, a soul and an expression. In my own words "to animate the glass." What special skills do you need as a master glass blower, especially when it comes to Chandeliers, which you have issues like balance and light flow to consider? It is important to coordinate your thoughts, going beyond the mass of red-hot glass you have in your hands, to all the movements needed to complete the piece you are creating. With the experience of years, your hands move by themselves, but sometimes not following the movements you've learned, not following your thoughts, but giving the piece that extra-thing that you didn't want. Let me explain: the steps needed to make a piece are well known, but sometimes it happens that your hands decide on their own, unbeknownst of your brain. It is at this moment that the 'soul of the artist' is expressed. Mostly it is work experience: analyzing the creations of the past, admiring the works of fellow glass masters, listening to your co-workers. Everyone helps me by expressing their judgments on the chandelier that I am creating. Of course, the ultimate decision is taken looking at result of the prototype. You must bear in mind that these equilibria are always changing, because of the development of new light technologies, from the low consumption lamps to the LEDs, from more practical and lighter structures, and more. We have to adapt and take advantage of what modern technology makes available to us. What would surprise readers that they probably don't know about the art of glass blowing and chandelier design? When we talk about the preciousness of Murano glass, the true value is not the glass itself, but the time necessary to produce it and the skill needed to make each part of a Classic Murano glass chandelier. Yes, we can give the Murano glass unique shades and colors, shapes and stunning curves, but the real secret is the art. The soul, the heart and the expertise of each Master is expressed inside his masterpiece, always unique. Regarding the design, if we want innovative products, I entrust myself to the young, not to experienced designers who often repeat themselves in their projects. I would like to meet new people, not accustomed to chandeliers which can give me new ideas and new emotions with their creativity. How has the process of glass blowing and chandelier making in Murano changed over time -- or are old-world traditions still a part of the production process? The new technologies have helped us much, everything has become easier: ovens are built with new materials, the methods of cooking the glass are verified step by step, the possibility of controlling the temperature of the oven without having to only look at the color of the glass and fire, as it was in the past. Once ovens used to run with coal or oil. When you took out the glass it was necessary to remove a black outer crust, thick up to 3 cm (more than 1 inch).The gas did not existed. The glass often came out stained and with bubbles on the inside. But, to be honest, some of nowaday's safety rules only repress our artisanship. Who issues these rules is not familiar with our traditional methods of working. Therefore by imposing rules which affect the ability of expression and craftsmanship of our work, they make it more difficult and increases also the working time. Certain jobs must be risky, as they were performed in the past, if you aim for the best results. You must be forced to use your bare hands, to keep a close contact with fire and molten glass. Forcing glass Masters to use gloves, glasses, ear plugs, leather bibs, degrades and depresses our manual labor. If you want to climb a mountain you have to be aware and prepared for the risks involved. To what extent the traditions of the past are part of the production process? This is the struggle of every craftsman. Trying to always remain faithful to the traditions but at the same time be competitive inside the modern global market, of which you are forced to follow the rules. In our industry, the craftsmanship and traditions are dominant, and we will always try to stay true to our traditions. Please describe the details of each stage of the production process -- from the design stage to the execution of the piece. It is not feasible to describe in a few lines all processes involved in the making of a chandelier: there are so many of them! Just think that the steps needed to make an arm are different from the ones needed to make a flower, a cup or a leaf. After the idea (a draft, a drawing or a sketch) we prepare the various mixtures of colored sands previously selected. These sandy mixtures are melted into separate ovens, the night before the manufacturing. The next day we start the production of each components, at six o' clock in the morning, divided by type: the arms, the central body, the cups and finally the flowers, leaves, curls and any other decorative item. Each gesture is almost automatic, but requires the utmost care. Later, the parts are put into another oven for “re-cooking” (oven for tempra). The glass can't go from a high production temperature of 500 - 800 degrees (900 - 1400 Fahrenheit), to room temperature too fast, or it will likely suffer a thermal shock with terrible consequences: cracks, breaks or even small explosions. This oven is necessary to strengthen the structure of the glass by slowly lowering the temperature, and bringing the piece to room temperature gradually. Then we move on to the second stage. Each piece is cut to an exact size, smoothed and polished from its sharp edges, and then inspected to remove any other imperfections, such as scratches or dust deposits. For the flowers, leaves and curls are applied to the bushings. The arms are then wired according to the country of delivery. Finials and pendants are tied with wires. The components are grouped by type,and the structure of the chandelier, which can be chrome or gold according to the type of chandelier, is hanged to a hook. Next comes the assembling of the chandelier, to check all the pieces, the balancing of the weights, and that the overall size corresponds to the request of the client. We eventually disassemble the chandelier and arrange the parts in trays for the vacuum packing. These trays are then packed in the corresponding cardboard boxes, ready for shipping. On average, how long does it take to make a chandelier? It is obvious that the time required to produce a chandelier depends on the type of chandelier and the number of lights. For a medium six light chandelier, which is simple enough, with the dimensions of 80 cm high and 80 cm in diameter ( 2 feet 7½ inches ) we need 4 people working 2 hours. I would like to remind you that every Master glass maker is matched by an assistant (Master to be) and an apprentice. If we take for example a Rezzonico chandelier with 12/16 lights with colorful flowers and curled leaves, the time required is more than 8 hours, always with four people working on it. If a client wants a custom chandelier, what additional steps are involved? First, according to the chandelier required, it is necessary a feasibility study, to see if the changes only applies to an existent model or if we have to plan and make a whole new chandelier. After that, we need a sketch with the dimensions. This design can be supplied by the customer or will be made by ourselves. We will then analyze the steps to follow for the execution, evaluate the costs and send the quote to the client. There aren't additional phases, we only need to choose the most suitable manufacturing technique in order to make the chandelier in the best way. What are some of your favorite pieces and why? I honestly do not have a favorite chandelier, indeed I will tell you that my favorite is always the last made. My creations are like beautiful women, the last known is always the most beautiful, but without ever forgetting the charm and elegance of the ones that came before. I like the new products with new materials and colors, and I am always looking for something beyond: shapes and glasses never seen before. Anyway, if I have to choose only one piece, it will surely be a wonderful and unique “Rezzonico” chandelier. If a glass collector is shopping for a fine hand-made chandelier, what aspects should one look for to know the piece is valuable? It is important to point up that the collector must be an "expert", or at least should know the techniques involved. With this knowledge he is able to assess the time taken for the production of the chandelier. Another feature that increases the value is the age of the glass. For example, a chandelier with glass perfectly transparent and clear is certainly not an antique chandelier. The time spent to achieve a Murano chandelier is less important than accuracy and passion dedicated on the creation of every single element. My advice is to always consult an expert or a trusted seller. What are some key factors in knowing that a piece is made by hand as compared to made by a machine? It's impossible to make a Murano chandelier with a machine. In case, you can check if some parts, such as pendants or cups, are made using a mold. But this is only applies to the modern chandeliers, which are quite simple, with linear forms and a few decorations. Do you have any interesting stories that you'd like to share about your career as a master glass blower? Yes, one in particular. It is an anecdote that could be useful if you need a special diet for weight loss. When I was apprentice, in the morning, when I began my work, I weighed 87 kg (191 lbs). The evening, when I was back home, I weighed 82 (180 lbs). I used to recover those kilos greedily eating during the night. Feel free to add anything you feel is important for readers to know that I haven't asked. I would like to add one thing: in our industry there might not be educated, polite and respectful persons. But no doubt those people share a great passion for their work. Despite their ignorance and rudeness, they are pure and genuine people, artists who make a tough and difficult job, working in a hard and difficult environment, but always having their heart and imagination free from any bond. This interview will also be published on the South Florida Opulence magazine.